Topics: Water Stain Remover, Ultra Gloss Sealant, All-purpose Cleaner, Glass And Mirror Cleaner, Gripper Pads, and Microfiber Towels. 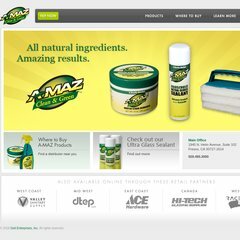 a-maz.com A-MAZ Water Stain Remover | Biodegradable, Non-toxic, Eco-friendly ..
PHP/5.2.17 is its coding language environment. There are 2 Nameservers, ns66.worldnic.com, and ns65.worldnic.com. It is hosted by Media Temple Inc. California, using Apache/2 web server. PING www. (64.13.232.198) 56(84) bytes of data.